Enter your telephone number in the app. In a moment you will get a text message with a password. Enter it in the app and your account is registered! Add your bank card to Mobilly and buy train tickets without supplementing your Mobilly account*. The ticket price will be deducted immediately from your bank card. 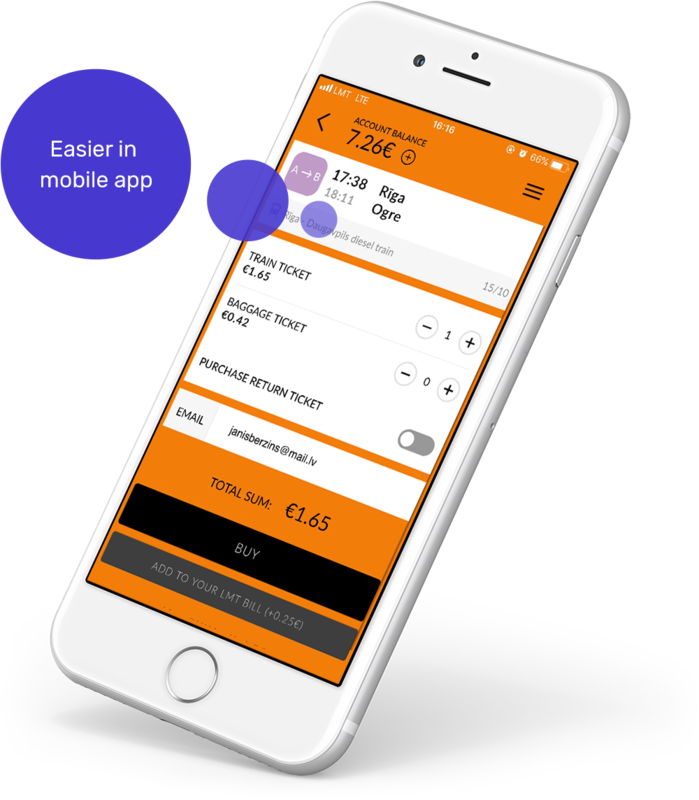 *When adding a bank card for the first time on the home page, you need to supplement your Mobilly account for a minimum amount of EUR 2.50. Can I have the money returned for the train ticket bought? In accordance with the amendments made by the Cabinet of Ministers Regulation No. 599 “Procedures for Provision and Use of Public Transport Services”, which came into force on March 4, 2016, you can return a diesel train ticket if there are more than two hours left until the departure of the trip. The amount that can be refunded is 75% of the ticket price. To have the money returned for diesel train or electric train tickets bought, send an email to info@mobilly.lv, indicating the phone number from which the ticket was bought, route, trip and time, as well as the reason for returning the ticket, or call us at 1859*. * The call may be subject to a charge set by the mobile operator depending on the tariff plan. You can also call +371 22001859. The company I work for has signed a contract with Mobilly. Can I buy a train ticket as a private person? Yes, you can. Although the phone number is added to the Company Account, you can also pay for all services as a private person. After selecting the desired trip, press the BUY button and you will be able to select PRIVATE ACCOUNT option. I want to buy a train ticket from the Company Account, but it fails. What should I do? To clarify the reason, call 1859* or 22001859. • The company has limited the time it takes to get train tickets by allowing them to be bought on specific days and times. • The phone number from which you want to buy the ticket is not added to Mobilly account. What should I do if I have bought a train ticket on the app, but it does not show with the active tickets? There may have been a break in the Internet and the ticket has not loaded into the app, so, please, reload the application by closing and reopening it. You can always view the Mobilly train ticket on the Mobilly website by logging in to your account and opening the Tickets section, from where you can download the train ticket in PDF format. Can I buy a to-and-fro train ticket with Mobilly? Yes, you can. When buying the ticket and specifying the number of tickets, press BUY RETURN TICKET and you will be able to select your return trip. Then you just need to know the departure time of your return trip train.